GEC Anderson – The Stainless Steel Products Specialists. ..
Specification Product Update > Kitchens, Bathrooms & Washrooms > GEC Anderson – The Stainless Steel Products Specialists. 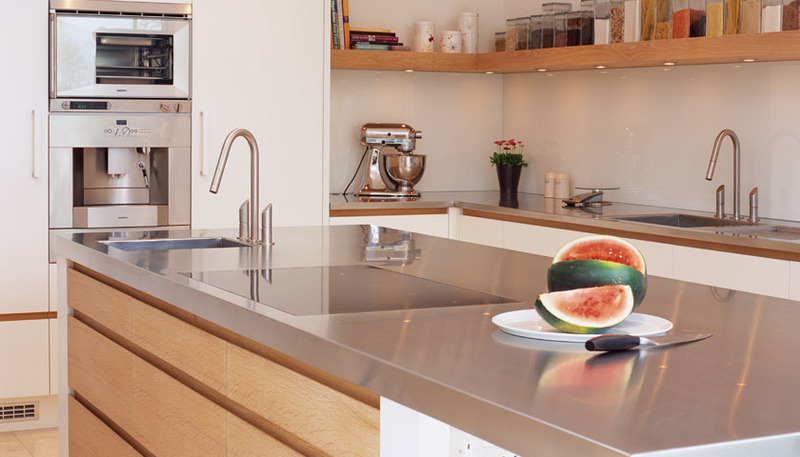 The Stainless Steel products Specialists GEC Anderson (established 1962) produce made to measure stainless steel sinks and worktops, suitable for commercial, residential and public environments. Our coordinated range also includes cabinets, shelving, splashbacks, panels and doors – all in top quality brushed satin stainless steel. Patina and Linen finishes are also available. Where standard products do not fit or simply are not good enough, GEC Anderson can provide worktops to any shape or size, including large and L-shapes. A wide range of edge profiles and upstands can be specified. Sink bowls can be provided in any location or combination. Cutouts, eg. for hobs or taps, can be provided as required. GEC Anderson work with projects of all sizes, from one off residential kitchens to major installations and have been involved in a wide range of sectors. To find out more on stainless steel products from GEC Anderson, please click here.